Machinarium developer Amanita Design is attempting to turn the tide against piracy with an amnesty sale. The shadow of piracy constantly looms over the PC gaming market, and indie developers are no exception to the trend. 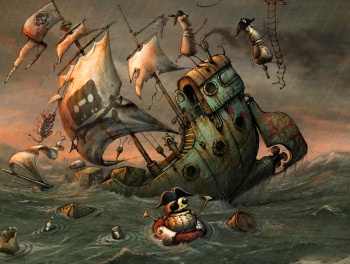 Czech-based developer Amanita Design announced yesterday that as many as 95% of the downloads of its recent point-and-click adventure game, Machinarium, were illegally grabbed by pirates. To make up for lost sales, the studio has announced an "amnesty" sale, giving both pirates and new players a chance to grab the game for a lower price. Machinarium, which was released last October, follows a robot named Josef as he makes his way through a wasteland to a machine-filled city. The game follows the traditional adventure game format, where a player must gather objects and use them to solve puzzles in order to progress. Machinarium was acclaimed for its unique graphic style and ability to convey hints and story details without the use of dialogue, winning an Independent Games Festival award for visual art. Game designer Jakub Dvorsky told Gamasutra today that only five to fifteen percent of people who downloaded the game bought it legitimately. He added, "We expected that our game would be soon available for free on torrents and other services, but the number of download links which emerged on the web almost immediately after the release really surprised us." Amanita Design doesn't include any form of anti-piracy measure on its games. Dvorsky believes that they don't matter, noting that these measures "only make the legal version less comfortable than some free hacked illegal version." There is a bit of a silver-lining in this story. Apparently, the piracy of the game led to new gamers discovering the independent studio. Amanita claims that a number of people contacted the studio, telling the developers that they had pirated the game and offering to pay the full price. In that spirit, the studio has announced a "pirate amnesty" sale. Anybody, whether they are a former pirate or a curious newcomer, can buy the game and its soundtrack for a measly $5, seventy-five percent off of the standard $20 tag. To take advantage of the sale price, you simply need to grab the game from the official site before next Thursday, August 12th. A browser-based demo is available for curious players.